POV (point of view) cameras seem to be all the rage suddenly in the “extreme” sports world, allowing miniscule self-contained video cameras to be attached to everything from surfboards, bikes, and race cars to your very own head. They’ve gotten smaller and cheaper and the quality has gone up dramatically just in the last year. Many are fully waterproof to great depths. 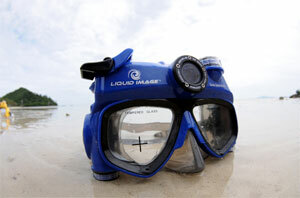 A company called Liquid Image (shown above) even makes a scuba mask that has a built in camera that shoots booth HD video and stills. While I’ve yet to see the trend carry over into the fly fishing realm in a big way yet, just think of the possibilities: cameras mounted to hat to show what the angler is really seeing (including fish-in-your-face netting action), recording the perfect drift trip, delivering a new angle on casting instruction, perhaps even cameras attached to the side of your flats boat. The possibilities are endless. While these POV cameras may never completely replace a high-end video or still camera, they’re going to be a lot of fun and fill in the gaps where other cameras could never go. Why Do Fishing Magazine Covers Always Look the Same?